This topic was published by DevynCJohnson and viewed 1079 times since " July 28, 2015 @ 06:00UTC ". The last page revision was " March 25, 2016 @ 14:43EDT ". Linux supports more emulators than many users would expect. Linux systems can handle many different arcade and game console emulators as well as emulators for different processors. However, the most surprising emulation software that Linux offers is emulation for DOS (Disk Operating System). It may sound odd, but Linux can run DOS, but not for the purposes many users would guess - games. There are a few DOS emulators, and some are better than others. The two most popular and stable DOS emulators for Linux are DOSbox and DOSemu. They each have advantages and disadvantages over each other. This article will discuss using DOS on Linux for gaming. To install DOSbox and DOSemu at the same time type "apt-get install dosbox dosemu". This single line will install both emulators. The user will be prompted for a password. Alternatively, a user can use their package manager to install the DOS emulators by searching for "dosbox" and "dosemu". The user can then select the two applications and tell the package manager to install the packages. 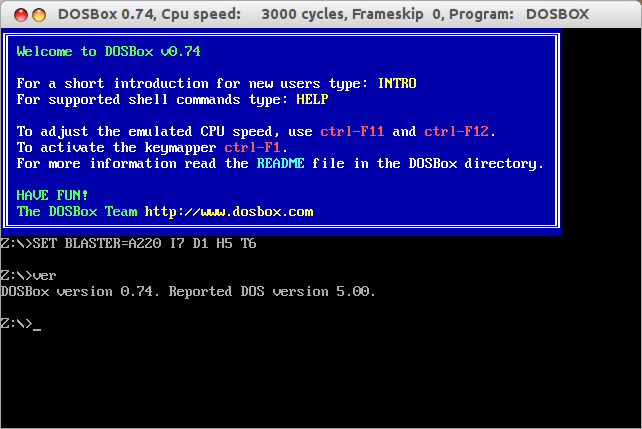 DOSbox is a free, open-source program written in C and C++. When the developers created DOSbox, the intended use was to play DOS games. This is an emulator meaning that this is not really the DOS by Microsoft. The DOS emulator pretends or acts like DOS. If I type the "ver" DOS command, the emulator prints the information the real DOS would print. Microsoft DOS is proprietary meaning that it is a non-free, closed-source program. So, Linux users cannot legally use the real DOS. Thankfully, Linux users can use an emulated DOS. DOS applications that once ran on i386 processors can run in DOSbox on any modern processor. DOSbox makes this possible because of hardware emulation. As far as the DOS programs are concerned, they are running on an old i386. However, they cannot detect that they are running on a modern system. The DOS emulator will even allow the use of some USB devices. 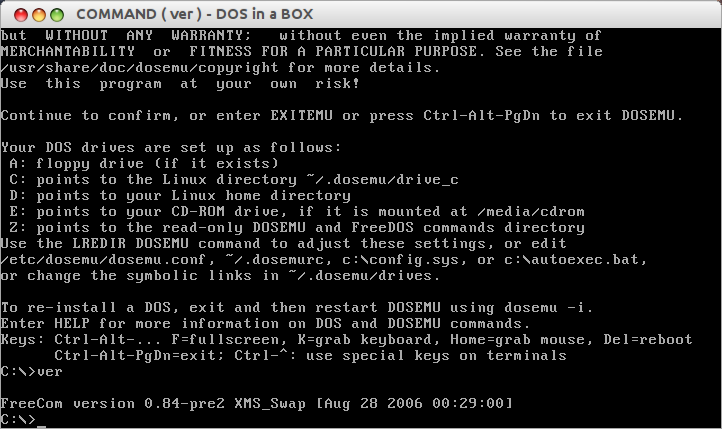 DOSemu (Disk Operating System Emulator) is no longer supported, but many Linux users still use it. This abandonware uses the same concepts as DOSbox, except it does not support USB devices. Overall, DOSbox has more features and better emulation than DOSemu. In general, the DOS emulators have no intended purpose for business use. The DOS emulators allow Linux users to play abandonware DOS games. In the Linux world, the DOS emulators are considered games. Some users may find non-gaming uses for these emulators like teaching and learning DOS; overall, these are just game emulators for Linux users. It is usually legal to download the original DOS games, and some developers have redesigned some of the old DOS games. Before downloading an original DOS game, make sure that it is legal to download. Usually, abandonware is legal to download and distribute, but not always. First, create a folder in the user's home directory titled "dosprogs". Next, open DOSbox and type "mount c ~/dosprogs". This will allow users to access files in the dosprogs folder that was created. Now, type "mount c ~/dosprogs". This command will make the dosprogs folder act as drive C. To access the folder, type "c:". By typing "dir" users can view the contents of virtual drive C. When using the Linux system, place legal DOS games and applications in the dosprogs folder. Then, while using DOSbox, type the name of the executable that is to be used. For example, if a user wanted to play "some_game.exe", they would type "some_game.exe". To make dosprogs automatically mount to virtual drive C follow these instructions. In DOSbox, type "config -writeconf /home/USERNAME/dosbox.conf" (replace USERNAME with your username). This will create a configuration file for DOSbox. After closing DOSbox (type "exit"), edit the configuration file and go to the line that contains "[autoexec]". On the next line type "mount c ~/dosprogs" and on the following line type "c:"; when done, save the file. Now, when DOSbox is started, those lines will be executed. This allows users to access the games more quickly because DOSbox will startup in the game folder. NOTE: dosprogs can have any name. Most users name it dosprogs, but feel free to give it any name like "Games" or "dos_games". On DOSemu, gamers can access DOS game by going to drive D (type "d:"). Drive D is the user's home folder on the Linux system. DOS gamers should probably make a folder on the Linux system titled "dos_games" and place their games in there. Then, to access the games from DOS, type "d:" and then "cd dos_games". To play a game, type the name of the game file. For instance, to play "fun_game.exe" type "fun_game.exe".